Wayne Rooney had an alibi for this latest Manchester United disappointment. If the home side�s play was slow and ineffective, lacking conviction in front of goal, it clearly could not be the injured captain�s fault. This could have been the day when United overtook their neighbours in the top four, instead it was another letdown. The home wingers displayed an early confidence but soon lost it, the midfield passing was predictable and frequently inaccurate, consequently Anthony Martial was as uninfluential as Rooney has been. United have now drawn their last three games and scored one goal in the process, so good luck to them on Tuesday night with their must-win Champions League game at Wolfsburg. Unusually for Old Trafford these days the game got off to an eventful start. Marouane Fellini sent a header narrowly over Adrián�s bar from Paddy McNair�s inviting cross in the opening minutes, then David de Gea prevented an early goal at the other end by coming out to save from Victor Moses. Actually Moses should have done better with that early chance, particularly as he pulled up injured before the interval. He had only the goalkeeper to beat after Daley Blind had wrongfooted his own defence by passing straight to Mark Noble. West Ham could not have asked for a clearer opportunity to go in front. 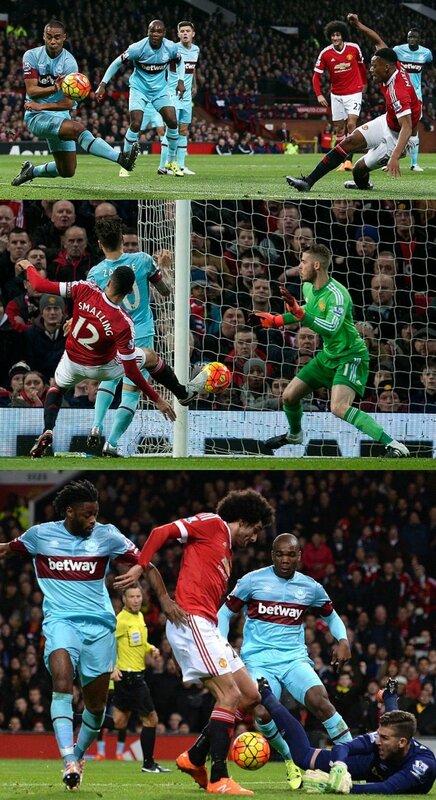 Fellaini�s ability in the air was being put to good use, and when he knocked down a cross for Martial the striker seemed certain to score with a close-range shot on the turn, only to find Winston Reid putting his body in the way to block. With West Ham hitting the same post twice in quick succession, once when Chris Smalling and Mauro Zárate challenged for the loose ball after De Gea spilled a cross, the next time when Reid was unlucky with a header from a corner, there was more goalmouth incident in the first half hour than this crowd has seen in whole games of late. The tempo had dropped by the break, however, and the second half was a plodding affair all too familiar to critics of Van Gaal�s patient passing game. By the hour mark only the flair and occasional audacity of Zárate was keeping the West Ham fans awake. The forward should have scored when a touch from Andy Carroll played him in behind the home back line yet he managed to miss the target completely after timing his run to perfection to stay onside. In the closing stages West Ham were defending most of the time and living a little dangerously, as their opponents applied pressure without managing to make it tell. Juan Mata capped an anonymous game by shooting wide, Schweinsteiger�s last act before being substituted was to fire over the bar. Ten minutes from the end United at least put a stylish attacking move together, Memphis Depay and Fellaini combining to allow Martial a shot, though the effort went wide, as did one from Jesse Lingard moments later.